Trapped between two worlds of social transition and modern progression, young women in the Middle East have for some time been forging means to balance conventional gender roles and marriage expectations, while also advancing their position in society through improved legal status, health, and educational attainment. Yet, with half of Egypt’s university educated women out of the labour market and not seeking work, this study reveals why middle class women continue to pursue a degree that they fail to use. The book invites the reader inside the urban homes of highly educated middle class Egyptian women to share their stories of spouse selection and marriage, and how education, wealth, and unyielding gender roles influence their employment status. 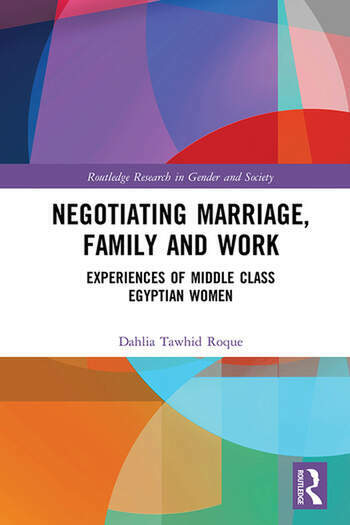 Through qualitative ethnography, Negotiating Marriage, Family and Work gives voice to young Egyptian women, both married and single, presenting their self-perceptions, their roles as mothers and wives, and their agency. Carried out from the time of the Arab Spring, this research sheds light on the key strategies that middle class women employ to secure their economic wellbeing in their marital and domestic contexts, as well as the barriers that married women face in combining paid work and family care. Dahlia Tawhid Roque has a PhD from Monash University, Australia, and is a youth employment consultant for the UN.